Have you ever wondered what your pet is thinking? Visions of rawhide bones, squirrel chases and juicy steaks might not be all that’s running through Fido or Fluffy’s head. Summit County has its own pet psychics, but they don’t like to refer to themselves that way. 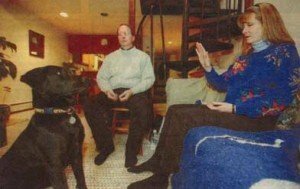 In the same vein as “Pet Psychic,” a show on Animal Planet, Frisco residents Dr. Anne Salisbury and Greg Meyerhoff communicate with animals and get to the bottom of what’s troubling them and causing their poor behavior. Salisbury and Meyerhoff are the founders of Intuitive Advantage, a company that helps individuals and businesses become more intuitive to “get in touch with their ability to flow with life and become more sensitive to energy,” Meyerhoff said. To help people do this, Meyerhoff and Salisbury first must “get in tune with” the individual. And they say they can do this just as easily with animals as they can with people. This is why, Salisbury explains, she and Meyerhoff also can tune into the minds of animals that have passed away and read the energy of a person or animal over the phone. Salisbury has a PhD in psychology and is a certified clinical hypnotherapist. She said she first became aware of her intuition at a young age when she would periodically get bogged down with other people’s emotions. Meyerhoff said he began honing in on his intuition during his 20 years in corporate sales as a senior account executive with Unisys. Meyerhoff and Salisbury recently tried their tuning on Maggie, a young black lab mix in Frisco who has problems with separation anxiety and barking at strangers. During the consultation, Meyerhoff said Maggie was “giving (him) an image” of a rottweiler’s face. Maggie’s owner then revealed that Maggie had been terrorized by a dog with rottweiler markings when she was a puppy. Meyerhoff and Salisbury said Maggie is quite protective of her space and is easily threatened, which might have resulted from this incident. During a different consultation for a different dog the duo conducted over the phone, Salisbury and Meyerhoff spoke with a dog owner whose dog had incessant ear infections. Without knowing anything about the owner’s hobbies or interests, and without being in his house, Meyerhoff said he kept seeing images of a rock band. It turned out the dog was reacting to loud music because its owner had band practice in the house several days a week. Meyerhoff and Salisbury say their talents are shared by all energetic beings, yet most individuals don’t take the time to harness and control them. Read the magazine article: What’s Going On In Your Pet’s Head?